This video shows the particle flow around Earth as solar ejecta associated with a coronal mass ejection strike. A coronal mass ejection (CME) is a significant release of plasma and accompanying magnetic field from the solar corona. They often follow solar flares and are normally present during a solar prominence eruption. The plasma is released into the solar wind, and can be observed in coronagraph imagery. Coronal mass ejections are often associated with other forms of solar activity, but a broadly accepted theoretical understanding of these relationships has not been established. CMEs most often originate from active regions on the Sun's surface, such as groupings of sunspots associated with frequent flares. Near solar maxima, the Sun produces about three CMEs every day, whereas near solar minima, there is about one CME every five days. Follow a CME as it passes Venus then Earth, and explore how the Sun drives Earth's winds and oceans. Coronal mass ejections release large quantities of matter and electromagnetic radiation into space above the Sun's surface, either near the corona (sometimes called a solar prominence), or farther into the planetary system, or beyond (interplanetary CME). The ejected material is a magnetized plasma consisting primarily of electrons and protons. While solar flares are very fast (being electromagnetic radiation), CMEs are relatively slow. Coronal mass ejections are associated with enormous changes and disturbances in the coronal magnetic field. They are usually observed with a white-light coronagraph. The phenomenon of magnetic reconnection is closely associated with CMEs and solar flares. In magnetohydrodynamic theory, the sudden rearrangement of magnetic field lines when two oppositely directed magnetic fields are brought together is called "magnetic reconnection". Reconnection releases energy stored in the original stressed magnetic fields. These magnetic field lines can become twisted in a helical structure, with a 'right-hand twist' or a 'left hand twist'. As the Sun's magnetic field lines become more and more twisted, CMEs appear to be a 'valve' to release the magnetic energy being built up, as evidenced by the helical structure of CMEs, that would otherwise renew itself continuously each solar cycle and eventually rip the Sun apart. On the Sun, magnetic reconnection may happen on solar arcades—a series of closely occurring loops of magnetic lines of force. These lines of force quickly reconnect into a low arcade of loops, leaving a helix of magnetic field unconnected to the rest of the arcade. The sudden release of energy during this process causes the solar flare and ejects the CME. The helical magnetic field and the material that it contains may violently expand outwards forming a CME. This also explains why CMEs and solar flares typically erupt from what are known as the active regions on the Sun where magnetic fields are much stronger on average. Satellite photo of aurora borealis stretching across Quebec and Ontario in the early morning of 8 October 2012. When the ejection is directed towards Earth and reaches it as an interplanetary CME (ICME), the shock wave of traveling mass causes a geomagnetic storm that may disrupt Earth's magnetosphere, compressing it on the day side and extending the night-side magnetic tail. When the magnetosphere reconnects on the nightside, it releases power on the order of terawatt scale, which is directed back toward Earth's upper atmosphere. Solar energetic particles can cause particularly strong aurorae in large regions around Earth's magnetic poles. These are also known as the Northern Lights (aurora borealis) in the northern hemisphere, and the Southern Lights (aurora australis) in the southern hemisphere. Coronal mass ejections, along with solar flares of other origin, can disrupt radio transmissions and cause damage to satellites and electrical transmission line facilities, resulting in potentially massive and long-lasting power outages. Energetic protons released by a CME can cause an increase in the number of free electrons in the ionosphere, especially in the high-latitude polar regions. The increase in free electrons can enhance radio wave absorption, especially within the D-region of the ionosphere, leading to Polar Cap Absorption (PCA) events. Humans at high altitudes, as in airplanes or space stations, risk exposure to relatively intense solar particle events. The energy absorbed by astronauts is not reduced by a typical spacecraft shield design and, if any protection is provided, it would result from changes in the microscopic inhomogeneity of the energy absorption events. 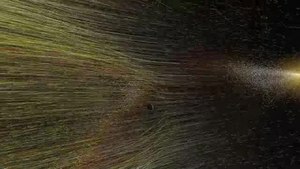 A video of the series of CMEs in August 2010. This video features two model runs. One looks at a moderate coronal mass ejection (CME) from 2006. The second run examines the consequences of a large coronal mass ejection, such as the Carrington-class CME of 1859. A typical coronal mass ejection may have any or all of three distinctive features: a cavity of low electron density, a dense core (the prominence, which appears on coronagraph images as a bright region embedded in this cavity), and a bright leading edge. Most ejections originate from active regions on the Sun's surface, such as groupings of sunspots associated with frequent flares. These regions have closed magnetic field lines, in which the magnetic field strength is large enough to contain the plasma. These field lines must be broken or weakened for the ejection to escape from the Sun. However, CMEs may also be initiated in quiet surface regions, although in many cases the quiet region was recently active. During solar minimum, CMEs form primarily in the coronal streamer belt near the solar magnetic equator. During solar maximum, they originate from active regions whose latitudinal distribution is more homogeneous. Coronal mass ejections reach velocities from 20 to 3,200 km/s (12 to 1,988 mi/s) with an average speed of 489 km/s (304 mi/s), based on SOHO/LASCO measurements between 1996 and 2003. These speeds correspond to transit times from the Sun out to the mean radius of Earth's orbit of about 13 hours to 86 days (extremes), with about 3.5 days as the average. The average mass ejected is 1.6×1012 kg (3.5×1012 lb). However, the estimated mass values for CMEs are only lower limits, because coronagraph measurements provide only two-dimensional data. The frequency of ejections depends on the phase of the solar cycle: from about one every fifth day near the solar minimum to 3.5 per day near the solar maximum. These values are also lower limits because ejections propagating away from Earth (backside CMEs) usually cannot be detected by coronagraphs. Current knowledge of coronal mass ejection kinematics indicates that the ejection starts with an initial pre-acceleration phase characterized by a slow rising motion, followed by a period of rapid acceleration away from the Sun until a near-constant velocity is reached. Some balloon CMEs, usually the slowest ones, lack this three-stage evolution, instead accelerating slowly and continuously throughout their flight. Even for CMEs with a well-defined acceleration stage, the pre-acceleration stage is often absent, or perhaps unobservable. The association of a CME with some of those phenomena is common but not fully understood. For example, CMEs and flares are normally closely related, but there was confusion about this point caused by the events originating beyond the limb. For such events no flare could be detected. Most weak flares do not have associated CMEs; most powerful ones do. Some CMEs occur without any flare-like manifestation, but these are the weaker and slower ones. It is now thought that CMEs and associated flares are caused by a common event (the CME peak acceleration and the flare impulsive phase generally coincide). In general, all of these events (including the CME) are thought to be the result of a large-scale restructuring of the magnetic field; the presence or absence of a CME during one of these restructures would reflect the coronal environment of the process (i.e., can the eruption be confined by overlying magnetic structure, or will it simply break through and enter the solar wind). It was first postulated that CMEs might be driven by the heat of an explosive flare. However, it soon became apparent that many CMEs were not associated with flares, and that even those that were often started before the flare. Because CMEs are initiated in the solar corona (which is dominated by magnetic energy), their energy source must be magnetic. Because the energy of CMEs is so high, it is unlikely that their energy could be directly driven by emerging magnetic fields in the photosphere (although this is still a possibility). Therefore, most models of CMEs assume that the energy is stored up in the coronal magnetic field over a long period of time and then suddenly released by some instability or a loss of equilibrium in the field. There is still no consensus on which of these release mechanisms is correct, and observations are not currently able to constrain these models very well. These same considerations apply equally well to solar flares, but the observable signatures of these phenomena differ. CMEs typically reach Earth one to five days after leaving the Sun. During their propagation, CMEs interact with the solar wind and the interplanetary magnetic field (IMF). As a consequence, slow CMEs are accelerated toward the speed of the solar wind and fast CMEs are decelerated toward the speed of the solar wind. The strongest deceleration or acceleration occurs close to the Sun, but it can continue even beyond Earth orbit (1 AU), which was observed using measurements at Mars and by the Ulysses spacecraft. CMEs faster than about 500 km/s (310 mi/s) eventually drive a shock wave. This happens when the speed of the CME in the frame of reference moving with the solar wind is faster than the local fast magnetosonic speed. Such shocks have been observed directly by coronagraphs in the corona, and are related to type II radio bursts. They are thought to form sometimes as low as 2 Rs (solar radii). They are also closely linked with the acceleration of solar energetic particles. On 1 November 1994, NASA launched the Wind spacecraft as a solar wind monitor to orbit Earth's L1 Lagrange point as the interplanetary component of the Global Geospace Science (GGS) Program within the International Solar Terrestrial Physics (ISTP) program. The spacecraft is a spin axis-stabilized satellite that carries eight instruments measuring solar wind particles from thermal to >MeV energies, electromagnetic radiation from DC to 13 MHz radio waves, and gamma-rays. Though the Wind spacecraft is over two decades old, it still provides the highest time, angular, and energy resolution of any of the solar wind monitors. It continues to produce relevant research as its data has contributed to over 150 publications since 2008 alone. On 25 October 2006, NASA launched STEREO, two near-identical spacecraft which, from widely separated points in their orbits, are able to produce the first stereoscopic images of CMEs and other solar activity measurements. The spacecraft orbit the Sun at distances similar to that of Earth, with one slightly ahead of Earth and the other trailing. Their separation gradually increased so that after four years they were almost diametrically opposite each other in orbit. The Parker Solar Probe was launched on 12 August 2018 to measure the mechanisms which accelerate and transport energetic particles i.e. the origins of the solar wind. The largest recorded geomagnetic perturbation, resulting presumably from a CME, coincided with the first-observed solar flare on 1 September 1859. The resulting solar storm of 1859 is now referred to as the Carrington Event. The flare and the associated sunspots were visible to the naked eye (both as the flare itself appearing on a projection of the Sun on a screen and as an aggregate brightening of the solar disc), and the flare was independently observed by English astronomers R. C. Carrington and R. Hodgson. The geomagnetic storm was observed with the recording magnetograph at Kew Gardens. The same instrument recorded a crochet, an instantaneous perturbation of Earth's ionosphere by ionizing soft X-rays. This could not easily be understood at the time because it predated the discovery of X-rays by Röntgen and the recognition of the ionosphere by Kennelly and Heaviside. The storm took down parts of the recently created US telegraph network, starting fires and shocking some telegraph operators. Historical records were collected and new observations recorded in annual summaries by the Astronomical Society of the Pacific between 1953 and 1960. The first detection of a CME as such was made on 14 December 1971, by R. Tousey (1973) of the Naval Research Laboratory using the seventh Orbiting Solar Observatory (OSO-7). The discovery image (256 × 256 pixels) was collected on a Secondary Electron Conduction (SEC) vidicon tube, transferred to the instrument computer after being digitized to 7 bits. Then it was compressed using a simple run-length encoding scheme and sent down to the ground at 200 bit/s. A full, uncompressed image would take 44 minutes to send down to the ground. The telemetry was sent to ground support equipment (GSE) which built up the image onto Polaroid print. David Roberts, an electronics technician working for NRL who had been responsible for the testing of the SEC-vidicon camera, was in charge of day-to-day operations. He thought that his camera had failed because certain areas of the image were much brighter than normal. But on the next image the bright area had moved away from the Sun and he immediately recognized this as being unusual and took it to his supervisor, Dr. Guenter Brueckner, and then to the solar physics branch head, Dr. Tousey. Earlier observations of coronal transients or even phenomena observed visually during solar eclipses are now understood as essentially the same thing. On 9 March 1989 a coronal mass ejection occurred. On 13 March 1989 a severe geomagnetic storm struck the Earth. It caused power failures in Quebec, Canada and short-wave radio interference. On 1 August 2010, during solar cycle 24, scientists at the Harvard–Smithsonian Center for Astrophysics (CfA) observed a series of four large CMEs emanating from the Earth-facing hemisphere of the Sun. The initial CME was generated by an eruption on 1 August that was associated with NOAA Active Region 1092, which was large enough to be seen without the aid of a solar telescope. The event produced significant aurorae on Earth three days later. On 23 July 2012, a massive, and potentially damaging, solar superstorm (solar flare, CME, solar EMP) occurred but missed Earth, an event that many scientists consider to be Carrington-class event. On 31 August 2012 a CME connected with Earth's magnetic environment, or magnetosphere, with a glancing blow causing aurora to appear on the night of 3 September. Geomagnetic storming reached the G2 (Kp=6) level on NOAA's Space Weather Prediction Center scale of geomagnetic disturbances. 14 October 2014 ICME was photographed by the Sun-watching spacecraft PROBA2 (ESA), Solar and Heliospheric Observatory (ESA/NASA), and Solar Dynamics Observatory (NASA) as it left the Sun, and STEREO-A observed its effects directly at 7011149597870700000♠1 AU. ESA's Venus Express gathered data. The CME reached Mars on 17 October and was observed by the Mars Express, MAVEN, Mars Odyssey, and Mars Science Laboratory missions. On 22 October, at 7011463753399170000♠3.1 AU, it reached comet 67P/Churyumov–Gerasimenko, perfectly aligned with the Sun and Mars, and was observed by Rosetta. On 12 November, at 7012148101891993000♠9.9 AU, it was observed by Cassini at Saturn. The New Horizons spacecraft was at 7012472729271412000♠31.6 AU approaching Pluto when the CME passed three months after the initial eruption, and it may be detectable in the data. Voyager 2 has data that can be interpreted as the passing of the CME, 17 months after. The Curiosity rover's RAD instrument, Mars Odyssey, Rosetta and Cassini showed a sudden decrease in galactic cosmic rays (Forbush decrease) as the CME's protective bubble passed by. According to a report published in 2012 by physicist Pete Riley of Predictive Science Inc., the chance of Earth being hit by a Carrington-class storm between 2012 and 2022 is 12%. There have been a small number of CMEs observed on other stars, all of which as of 2016[update] have been found on M dwarfs. These have been detected by spectroscopy, most often by studying Balmer lines: the material ejected toward the observer causes asymmetry in the blue wing of the line profiles due to Doppler shift. This enhancement can be seen in absorption when it occurs on the stellar disc (the material is cooler than its surrounding), and in emission when it is outside the disc. The observed projected velocities of CMEs range from ≈84 to 5,800 km/s (52 to 3,600 mi/s). Compared to activity on the Sun, CME activity on other stars seems to be far less common. ^ Christian, Eric R. (5 March 2012). "Coronal Mass Ejections". NASA/Goddard Space Flight Center. Retrieved 9 July 2013. ^ Hathaway, David H. (14 August 2014). "Coronal Mass Ejections". NASA/Marshall Space Flight Center. Retrieved 7 July 2016. ^ "Coronal Mass Ejections". NOAA/Space Weather Prediction Center. Retrieved 7 July 2016. ^ Fox, Nicky. "Coronal Mass Ejections". NASA/International Solar-Terrestrial Physics. Retrieved 6 April 2011. ^ Gleber, Max (21 September 2014). "CME Week: The Difference Between Flares and CMEs". NASA. Retrieved 7 July 2016. ^ "Scientists unlock the secrets of exploding plasma clouds on the sun". Eurekalert.org. American Physical Society. 8 November 2010. Retrieved 7 July 2016. ^ Phillips, Tony, ed. (1 March 2001). "Cannibal Coronal Mass Ejections". Science News. NASA. Retrieved 20 March 2015. ^ Green, Lucie (2014). 15 Million Degrees. Viking. p. 212. ISBN 0-670-92218-8. ^ Holman, Gordon D. (April 2006). "The Mysterious Origins of Solar Flares". Scientific American. 294 (4): 38–45. Bibcode:2006SciAm.294d..38H. doi:10.1038/scientificamerican0406-38. PMID 16596878. ^ Baker, Daniel N.; et al. (2008). Severe Space Weather Events—Understanding Societal and Economic Impacts: A Workshop Report. National Academies Press. p. 77. doi:10.17226/12507. ISBN 978-0-309-12769-1. These assessments indicate that severe geomagnetic storms pose a risk for long-term outages to major portions of the North American grid. John Kappenman remarked that the analysis shows "not only the potential for large-scale blackouts but, more troubling, ... the potential for permanent damage that could lead to extraordinarily long restoration times." ^ a b Morring, Jr., Frank (14 January 2013). "Major Solar Event Could Devastate Power Grid". Aviation Week & Space Technology. pp. 49–50. But the most serious potential for damage rests with the transformers that maintain the proper voltage for efficient transmission of electricity through the grid. ^ Carroll, Bradley W.; Ostlie, Dale A. (2007). An Introduction to Modern Astrophysics. San Francisco: Addison-Wesley. p. 390. ISBN 0-8053-0402-9. ^ Tomczak, M.; Chmielewska, E. (March 2012). "A Catalog of Solar X-Ray Plasma Ejections Observed by the Soft X-Ray Telescope on Board Yohkoh". The Astrophysical Journal Supplement Series. 199 (1). 10. arXiv:1201.1040. Bibcode:2012ApJS..199...10T. doi:10.1088/0067-0049/199/1/10. ^ Andrews, M. D. (December 2003). "A Search for CMEs Associated with Big Flares". Solar Physics. 218 (1): 261–279. Bibcode:2003SoPh..218..261A. doi:10.1023/B:SOLA.0000013039.69550.bf. ^ Manoharan, P. K. (May 2006). "Evolution of Coronal Mass Ejections in the Inner Heliosphere: A Study Using White-Light and Scintillation Images". Solar Physics. 235 (1–2): 345–368. Bibcode:2006SoPh..235..345M. doi:10.1007/s11207-006-0100-y. ^ Freiherr von Forstner, Johan L.; Guo, Jingnan; Wimmer-Schweingruber, Robert F.; et al. (January 2018). "Using Forbush Decreases to Derive the Transit Time of ICMEs Propagating from 1 AU to Mars". Journal of Geophysical Research: Space Physics. 123 (1): 39–56. arXiv:1712.07301. Bibcode:2018JGRA..123...39F. doi:10.1002/2017JA024700. ^ Richardson, I. G. (October 2014). "Identification of Interplanetary Coronal Mass Ejections at Ulysses Using Multiple Solar Wind Signatures". Solar Physics. 289 (10): 3843–3894. Bibcode:2014SoPh..289.3843R. doi:10.1007/s11207-014-0540-8. ^ Wilkinson, John (2012). New Eyes on the Sun: A Guide to Satellite Images and Amateur Observation. Springer. p. 98. ISBN 978-3-642-22838-4. ^ Vourlidas, A.; Wu, S. T.; Wang, A. H.; Subramanian, P.; Howard, R. A. (December 2003). "Direct Detection of a Coronal Mass Ejection-Associated Shock in Large Angle and Spectrometric Coronagraph Experiment White-Light Images". The Astrophysical Journal. 598 (2): 1392–1402. arXiv:astro-ph/0308367. Bibcode:2003ApJ...598.1392V. doi:10.1086/379098. ^ Manchester, W. B., IV; Gombosi, T. I.; De Zeeuw, D. L.; Sokolov, I. V.; Roussev, I. I.; et al. (April 2005). "Coronal Mass Ejection Shock and Sheath Structures Relevant to Particle Acceleration" (PDF). The Astrophysical Journal. 622 (2): 1225–1239. Bibcode:2005ApJ...622.1225M. doi:10.1086/427768. Archived from the original (PDF) on 5 February 2007. ^ "Spacecraft go to film Sun in 3D". BBC News. 26 October 2006. Nicholson, Seth B. (1954). "Solar Activity in 1953". Publications of the Astronomical Society of the Pacific. 66 (389): 55–57. Bibcode:1954PASP...66...55N. doi:10.1086/126653. ISSN 0004-6280. JSTOR 40672795. Cragg, Thomas A. (1955). "Solar Activity in 1954". Publications of the Astronomical Society of the Pacific. 67 (395): 99–101. Bibcode:1955PASP...67...99C. doi:10.1086/126771. ISSN 0004-6280. JSTOR 40672921. Nicholson, Seth B. (1956). "Solar Activity in 1955". Publications of the Astronomical Society of the Pacific. 68 (401): 146–148. Bibcode:1956PASP...68..146N. doi:10.1086/126899. ISSN 0004-6280. JSTOR 40673035. Cragg, Thomas A. (1957). "Solar Activity in 1956". Publications of the Astronomical Society of the Pacific. 69 (407): 166–168. Bibcode:1957PASP...69..166C. doi:10.1086/127038. ISSN 0004-6280. JSTOR 40676393. Cragg, Thomas A. (1958). "Solar Activity in 1957". Publications of the Astronomical Society of the Pacific. 70 (414): 299–302. Bibcode:1958PASP...70..299C. doi:10.1086/127227. ISSN 0004-6280. JSTOR 40673342. Cragg, Thomas A. (1959). "Solar Activity in 1958". Publications of the Astronomical Society of the Pacific. 71 (420): 212–215. Bibcode:1959PASP...71..212C. doi:10.1086/127366. ISSN 0004-6280. JSTOR 40673498. Cragg, Thomas A. (1960). "Solar Activity in 1959". Publications of the Astronomical Society of the Pacific. 72 (426): 200–203. Bibcode:1960PASP...72..200C. doi:10.1086/127509. ISSN 0004-6280. JSTOR 40676961. Cragg, Thomas A. (1961). "Solar Activity in 1960". Publications of the Astronomical Society of the Pacific. 73 (432): 198–201. Bibcode:1961PASP...73..198C. doi:10.1086/127655. ISSN 0004-6280. JSTOR 40673546. ^ Howard, Russell A. (October 2006). "A Historical Perspective on Coronal Mass Ejections" (PDF). Solar Eruptions and Energetic Particles. Geophysical Monograph Series. 165. American Geophysical Union. Bibcode:2006GMS...165....7H. doi:10.1029/165GM03. ^ Howard, Russell A. (1999). "Obituary: Guenter E. Brueckner, 1934-1998". Bulletin of the American Astronomical Society. 31 (5): 1596. Bibcode:1999BAAS...31.1596H. ^ a b Phillips, Tony (23 July 2014). "Near Miss: The Solar Superstorm of July 2012". NASA. Retrieved 26 July 2014. ^ "ScienceCasts: Carrington-class CME Narrowly Misses Earth". YouTube.com. NASA. 28 April 2014. Retrieved 26 July 2014. ^ "NASA's SDO Sees Massive Filament Erupt on Sun". NASA. 4 September 2012. Retrieved 11 September 2012. ^ "August 31, 2012 Magnificent CME". NASA/Goddard Space Flight Center. 31 August 2012. Retrieved 11 September 2012. ^ "Space Weather Alerts and Warnings Timeline: September 1–16, 2012 (archive)". NOAA. Archived from the original on 28 September 2012. Retrieved 24 September 2012. ^ Chillymanjaro (6 September 2012). "Geomagnetic storming levels back to normal". The Watchers. Retrieved 11 September 2012. ^ Witasse, O.; Sánchez-Cano, B.; Mays, M. L.; Kajdič, P.; Opgenoorth, H.; et al. (14 August 2017). "Interplanetary coronal mass ejection observed at STEREO-A, Mars, comet 67P/Churyumov-Gerasimenko, Saturn, and New Horizons en route to Pluto: Comparison of its Forbush decreases at 1.4, 3.1, and 9.9 AU". Journal of Geophysical Research: Space Physics. Bibcode:2017JGRA..122.7865W. doi:10.1002/2017JA023884. ^ "Tracking a solar eruption through the Solar System". SpaceDaily. 17 August 2017. Retrieved 22 August 2017. ^ Riley, Pete (February 2012). "On the probability of occurrence of extreme space weather events". Space Weather. American Geophysical Union. 10 (2). Bibcode:2012SpWea..10.2012R. doi:10.1029/2011SW000734. ^ Korhonen, Heidi; Vida, Krisztian; Leitzinger, Martin; et al. (20 December 2016). "Hunting for Stellar Coronal Mass Ejections". arXiv:1612.06643 [astro-ph.SR]. ^ a b Vida, K.; Kriskovics, L.; Oláh, K.; et al. (May 2016). "Investigating magnetic activity in very stable stellar magnetic fields. Long-term photometric and spectroscopic study of the fully convective M4 dwarf V374 Pegasi". Astronomy & Astrophysics. 590. A11. arXiv:1603.00867. Bibcode:2016A&A...590A..11V. doi:10.1051/0004-6361/201527925. ^ Leitzinger, M.; Odert, P.; Ribas, I.; et al. (December 2011). "Search for indications of stellar mass ejections using FUV spectra". Astronomy & Astrophysics. 536. A62. Bibcode:2011A&A...536A..62L. doi:10.1051/0004-6361/201015985. ^ Houdebine, E. R.; Foing, B. H.; Rodonò, M. (November 1990). "Dynamics of flares on late-type dMe stars: I. Flare mass ejections and stellar evolution". Astronomy & Astrophysics. 238 (1–2): 249–255. Bibcode:1990A&A...238..249H. ^ Leitzinger, M.; Odert, P.; Greimel, R.; et al. (September 2014). "A search for flares and mass ejections on young late-type stars in the open cluster Blanco-1". Monthly Notices of the Royal Astronomical Society. 443 (1): 898–910. arXiv:1406.2734. Bibcode:2014MNRAS.443..898L. doi:10.1093/mnras/stu1161. Gopalswamy, Natchimuthukonar; Mewaldt, Richard A.; Torsti, Jarmo, eds. (2006). Solar Eruptions and Energetic Particles. Geophysical Monograph Series. 165. American Geophysical Union. Bibcode:2006GMS...165.....G. doi:10.1029/GM165. ISBN 0-87590-430-0. Bell, Trudy E.; Phillips, Tony (6 May 2008). "A Super Solar Flare". Science@NASA. NASA. Lavraud, Benoit; Masson, Arnaud (21 November 2007). "Cluster captures the impact of CMEs". European Space Agency. Morring, Frank, Jr. (14 January 2013). "Major Solar Event Could Devastate Power Grid". Aviation Week & Space Technology. Odenwald, Sten F.; Green, James L. (28 July 2008). "Bracing the Satellite Infrastructure for a Solar Superstorm". Scientific American. Phillips, Tony (27 May 2008). "Cartwheel Coronal Mass Ejection". Science@NASA. NASA. Wikimedia Commons has media related to Coronal mass ejection.